Storms Blog: Little Chat and Autumn Favourites! Its finally October meaning here in the UK the weather is now beginning to get wintery' and cold enough for scarves and my much loved black, ankle heeled boots. 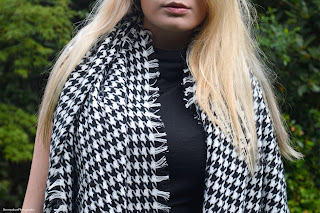 I love this huge monochrome scarf from Primark which I believe only cost me £5 which is incredible! The quality is really good and the scarf itself seems really warm, I am looking forward to wearing this with many outfits in the next few months! A few weeks ago now I ruined my favourite pair of swede black ankle boots which I wore everywhere! I have felt lost without them since I broke them and I have been on the hunt for some more to replace them and I managed to come across these in Primark - These boots cost me £18 which once again is a really good price for the quality of the item. 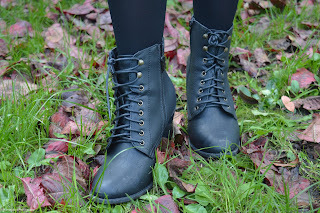 Im sure you will be seeing these boots in many OOTD photos soon! I will have many more Autumn fashion must-have's soon, but I would love to know what you are loving this autumn, let me know below!